In yet another demonstration of the never-ending hacking possibilities of the ASUS Eee PC laptop, three criminals in Brazil rigged an ATM with the little low cost computer to grab credit card information and personal information numbers to clone cards. Smart, except that one of them was a total moron. 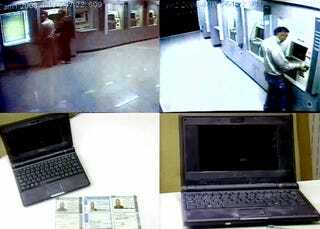 The three men were specialized in cloning credit cards at ATMs, always with the same method. As you can see in the video, the first opens one of the machines, then another one comes to help him with the installation of a black Eee PC. Then they always proceeded to disable the rest of the machines, so clients were forced to use the rigged ATM. All this while they were being recorded by bank security cameras, of course.